Whether you’re travelling interstate or just looking for a country getaway, make sure to stop by Goondiwindi. This little country town sits on the border of Queensland and New South Wales, making it a popular destination for travellers on a road trip. 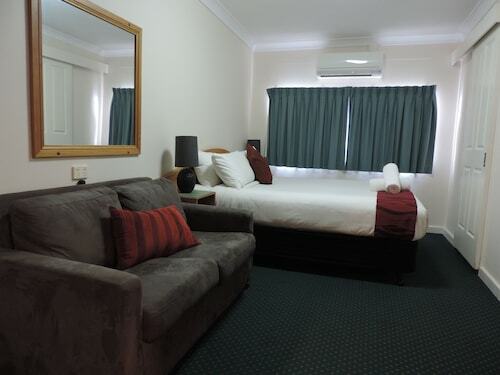 Stay in one of our Goondiwindi hotels to explore this inviting rural town. Goondiwindi’s claim to fame is Gunsynd, an Australian Thoroughbred racehorse that won several Cups and championships in the 60s and 70s. Gunsynd’s legacy lives on in Goondiwindi, with one of the town’s major landmarks being a life-sized statue of the horse and his jockey, located in the middle of town. The Gunsynd Museum was opened in 2007 as part of the Goondiwindi Visitor Centre and you can go there to view Gunsynd’s trophies, photos and other tributes to the horse’s achievements. For a step back in time, visit the Custom House Museum. The museum is based in a charming colonial-style cottage built in 1863 and features many treasured personal items loaned by local families. These items, ranging from farming equipment to clothing, gives a glimpse into the lives of the Goondiwindi townsfolk back in the day. The Gardens at the museum are another popular spot for both locals and tourists alike. See if you can spot the ‘trunk’ and ‘ears’ of the Elephant Tree or just relax under the shade of the plants and shrubs, some of which have been in the Gardens since the 1970s! Goondiwindi is also known for its cotton production. At Goondiwindi Cotton, you can take a tour of a cotton farm and stand among rows of the fluffy, white blooms while listening to tales and legends of the town. Finish off your tour with a trip to the Fashion House, which sells clothing created at local cotton farms. The offcuts from the cotton grown in Goondiwindi are also used at the Euraba Paper Company, an indigenous group that creates papers and art by hand. See the exhibited works at the art gallery, which are created with techniques such as embossing and weaving. You can even take some of these handmade works home with you at the souvenir shop. Each year, hundreds of athletes from around the country visit Goondiwindi to participate in the Hell of the West triathlon. Held since 1989, the triathlon consists of a 1.5km swim, 40km cycle and 10km run – phew! Another major event is Gourmet in Gundy, a community event held in September. Gourmet in Gundy is a hodgepodge of events to please attendees of all ages, such as golf tournaments, a photography exhibition, cooking classes and horse races. Make sure to book your Goondiwindi accommodation early if you’re attending either of these events. Explore the rich history of Goondiwindi and all it has to offer with our accommodation in Goondiwindi. How Much is a Hotel Room in Goondiwindi? Hotels in Goondiwindi start at AU$104 per night. Prices and availability subject to change. Additional terms may apply.